(I recommend a random & all-over print. Here's my old gardening bucket. Dirt and all. but the inside isn't too pretty. Oh, how I love me some spray paint. Especially American Accents from Lowes. It is by far the best spray paint ever. Trust me, I have tried them all. I sprayed the insides, rim and handle Sweet Pea Pink. When the paint dries, take it inside to a big table. Get out some old wrapping paper and roll it out on your table. Start with one side of the bucket and trace as you roll it along the paper. always making sure that it is lined up. Cut out the wrapping paper. Place it on your bucket to make sure it fits. Trim up any areas that are too big. Now you have a pattern. Place it on your fabric and cut away. Make sure that you have the top of the pattern going the right way on your fabric. Grab your spray adhesive, fabric and bucket and head outside. Lay the bucket down with the front middle facing you. Spray some adhesive on the bucket. Take the middle of the fabric and press it down on to the bucket. Smooth out any wrinkles and make sure it is lining up with the top. the bucket is gorgeous and covered with fabric goodness. I am using this yummy refab to store Janey's toys. there will be a photo shoot involved. Minus the headband of course! This is a GREAT idea for an instant one of a kind EASTER BASKET. All that's missing is the colored straw. You are so creative! Now how cute is that?! I have TONS of buckets I have gathered during my party planning obsession!! I am sure I could part with just one?!! Love it. I must actually try this one (yeah for no-sew). Thanks!! That bucket rocks thanks for the tutorial! I have totally been wondering how to do this because I have one of those galvanized buckets that would be perfect to put fabric over...only problem? No idea how! Problem solved!! Thanks! This is so cute. Love these ideas. I just ran into your blog...LOVE IT! 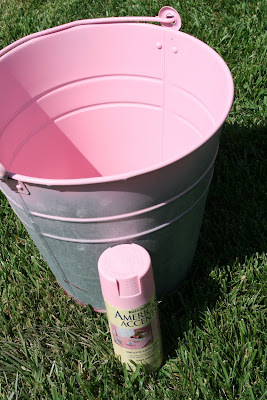 I adore this bucket project. Can't wait to read more! sickening cute! gimme that! love, love!!!!! Love, love, love it! Thanks for the weekend project! p.s. I'm having a SewSara giveaway on my blog! What a great idea!!! Thanks for the tutorial! 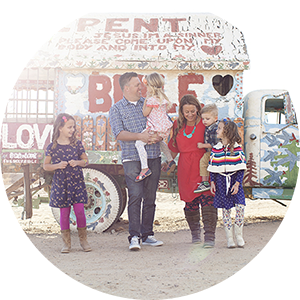 i love to make these julie and you just made the process so much easier. a pattern? what a great idea! DUH. i can't wait for the photo shoot! Oh my gosh, love it!! I made a toile covered one with scrapbook paper for a swap I did in the Fall. It turned out so cute!! 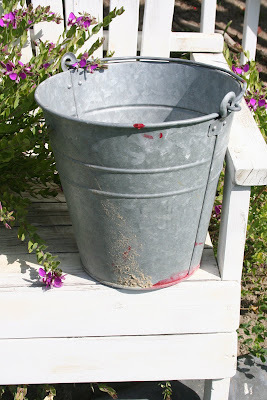 I did this years ago for a taller more slender bucket that I use as a trashcan in my bathroom, cute stuff. I also covered a canvas yesterday with some wallpaper, just for some pizazz on a blah wall. I posted about it, if you'd like to check out my result. That is soo funny. I went to your blog site to ask you how you store all of your fabric. I'm swimming in it and have a room designated for crafts, but everything is just everywhere and I can't find anything!!! Love the bucket idea! We use lots of galvanized containers and hand tags identifying the insides!!! Any ideas on fabric storage would be appreciated! AAAAHHHHHHHHHHH! This is so CUTE! Shut the door girl! I am pretty sure there's not one thing you've done thats not cute! So, so cute! Love it. Fabulous idea! Much easier than the easter basket I was planning to make. Thanks! I have a question about your shirts that you applique - is that what you do, with the ironing and everything, or do you just sew on the fabric? I love everything you post! I am loving that fabric! You have found so many uses it! I want!! So that project will have to wait...because our grass is not green at the moment like in your picture....it is COVERED with many inches of snow! We are practically snowed in here! Wishing I could go out and spray paint!! Oh...and you need to come ski with me! That is so creative! I love it!!! What a great idea! I actually just bought a cute little bucket at a garage sale TODAY!! I read your blog and had the project done in less than 30 minutes. I decided to use Mod Podge since I didn't want to get outside in the blizzard to use spray adhesive. It might even be better because it's now somewhat sealed. I think it'd be really cute to add a monogram to the front too! thanks again for all the creative inspirations. yay! i've been wanting to do this for so long now. but is that it? it seems too easy. did you protect it with anything after, like mod podge or varnish?